Front Street Shipyard in Maine has completed refit and maintenance work on superyacht Asolare. The 47.15 metre sailing superyacht is the former Scheherazade, which we reported sold through Edmiston & Company and Sparkman & Stephens in 2013. At the time of sale she had an asking price of $15.95 million. Built to a design by Bruce King, the yacht was built by Hodgdon Yachts in 2003 with a cold-moulded hull in wood and epoxy. At 154 feet, she was the largest cold-moulded yacht ever built, with complex systems and relatively tall spars. Having celebrated her tenth birthday, the boat, now named Asolare, was due for her Lloyd’s survey, a fresh paint job and some systems maintenance. She spent the autumn of 2014 with Front Street Shipyard, in Belfast, Maine, during heavy snowfall. 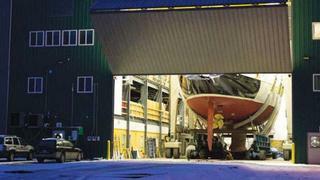 The shipyard said in its online magazine that just getting the yacht in and out of the building was a challenge – and the shipyard shot this video below on a cold, snowy day as the Front Street team and Brownell Systems moved Asolare out. Front Street has a shop that measures less than a metre more than the boat and there was a foot of clearance on either side of her once inside. Brownell Systems built a special trailer to slide her into and out of the shop. Working with the yacht’s crew, the Front Street team identified several updates that would give Asolare’s crew and guests more comfort, including new wiring through the hull and mast for computer, electronics and entertainment systems. Some of the boat’s hydraulics also needed maintenance and upgrades were made to the most critical systems on board the boat. Front Street says it expects *Asolare *back at the yard for a visit this spring when it will undertake some additional work before her summer sailing season.